Mom told me years and years ago she always liked to clean the house by re-arranging the furniture. Move the sofa here, place the dining room table there…you know…shake it up a little. Gradually over time she stopped that nonsense, finding just the perfect spot for the piano, the lazy-boy chairs, the beds in the bedrooms…they fit perfectly, so there they have stayed forever. I told you this little story, because now Dad has taken to rearranging the ditches. Well, really only one ditch—it’s slightly crooked, you see. And he wants to ‘square up’ the field. It’s the MUD ditch! Mom’s least favorite ditch to work from. But in order to have the Mud ditch moved a few feet we had to get the ditch ready to move come March. First we had to pick up all the syphon tubes, remove the gated pipe and the dams. Then we had to move the one stick of gated pipe…hard job. It’s still out there waiting for Mom and Dad to go get it. But nothing was as hard as removing the culvert between the cement ditch and the gated pipe. The carefully cemented in culvert had to be chopped-out. One smack at a time. I hung around while they did the syphon tubes, but that cement stuff seemed to take forever. 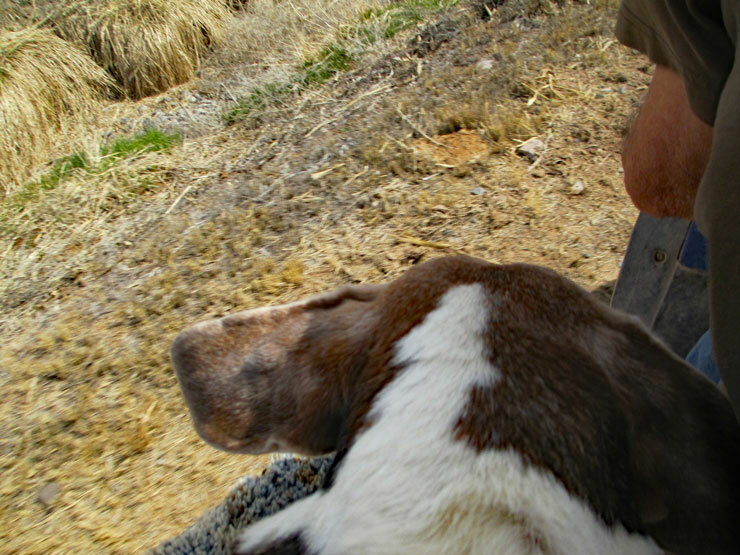 Therefore, I checked out the deer, the pheasants, all the Quail…rabbits….you understand. NEWS! When I got back they were ready to haul two loads of the broken cement up to the head gate. (Dad is trying to shore-up the banks so they don’t keep washing away. Up we went — back we came, and up we went again. I didn’t jump off; just waited there guarding the four-wheeler and the cement chunks from angry badgers or something. Boomer…the best Guard dog on the farm! This entry was posted in Adventures of Boomer, Fuzzy & Boomer, Life on a Colorado Farm and tagged Beagle, Boomer, cement ditch, Guard Dog, life on a Colorado farm, mud ditch, The Adventures of Boomer on Friday----Re-arranging the Ditch by Dayphoto. Bookmark the permalink. Guarding chunks of cement is sweaty, tough work, B. Plus maybe a good place to take a nap…. just sayin’. Well done. That’s what I think…sit on the seat and watch! Boomer! What would they do without you Boomer? Boomer, you’re the best guard dog anywhere! Wow, what a job :-o. Once again we learn so much from Boomer the Beagle.